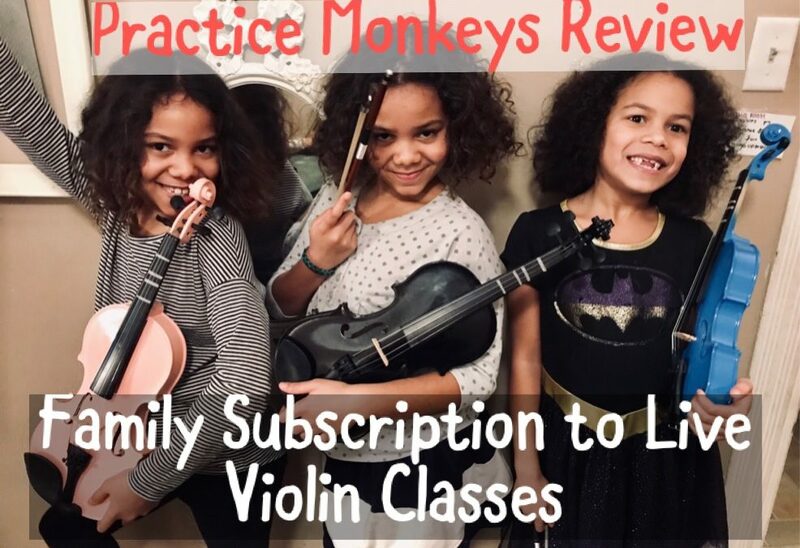 Let me introduce you to my family’s, and a number of other families, dream come true, answer to prayer, saving grace: Practice Monkeys and their Family Subscription to Live Violin Classes that we had the incredible honor of reviewing over the last three months! Imagine, for a moment, that you, the homeschool parent, were empowered to instruct your child in a musical instrument you didn’t know how to play. Imagine if your child could experience a group class 4 days a week along with exposure to hours of tutoring lessons to feast on at his or her own discretion. Imagine that workbooks, lessons, live group lessons, and unlimited support and communication were offered to you for low price of $49 per FAMILY (not per student, but PER HOUSEHOLD!). And, imagine, if you never needed to leave your home! Is this the fulfillment of the dream of many homeschool families? Could this be the answer to the question, “How in the world do I afford/budget time/mange several children in our asperations to give them the priceless gift of a musical language? For us, reviewing Practice Monkeys was more than a dream come true. 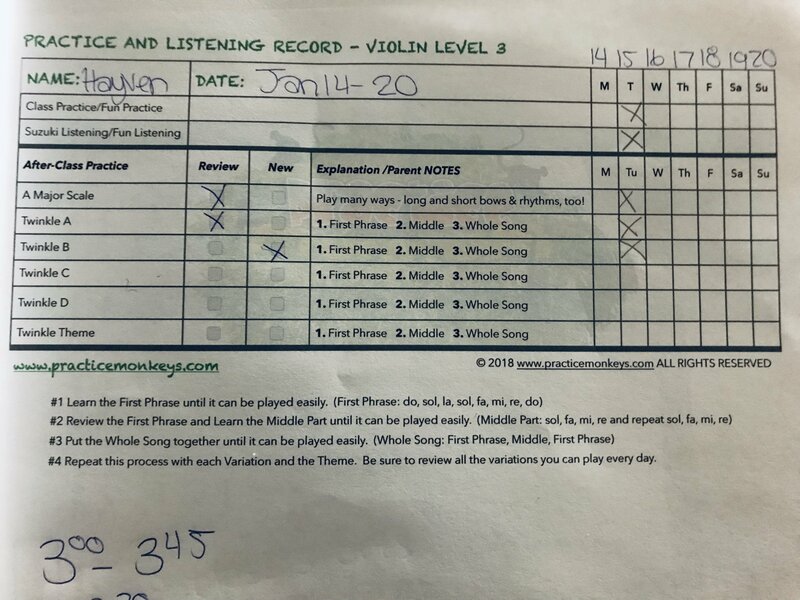 I don’t even believe that my words can fully illustrate the brilliance of what Mrs. Sarah Van Kleeck has put together for violin (and now PIANO) instruction. So please reader, indulge me by watching a short, ten-minute, video SHOWING you the progress that three months of diligent commitment to Practice Monkeys has developed in my family before I give you the bones, nuts, bolts and structure of this colossal, world-wonder in the city of homeschooling: Practice Monkeys! Mrs. Sarah Van Kleeck is an instructor of violin for 26 years. She received private instruction from childhood into college and then Suzuki teacher training after that. If you are unfamiliar with the Suzuki method of teaching, I would highly encourage you to read up on it; in a nutshell, Suzuki method of music instruction was created by the Japanese violinist names Shinichi Suzuki. He noticed the parallels of learning a native language with learning music. Based on these observations stemed his belief and practice that music should bring beauty and joy and should be learned from one’s environment. A saturation in music, deliberate avoidance of musical apitutde tests, an emphasis on very young children playing instruments, well-trained teachers, parents as mentors and as the largest influence on students, learning to play music by ear before reading music, playing in groups often, and other ideas mark the foundation for any Suzuki protege. Practice Monkeys takes the foundational bricks of the method Suzuki crafted and builds a 21st century skyscraper where the heavens are the limit! There is so much growth and potential for any student utilizing what Mrs. Van Kleeck has created that, truly, the only obstacle standing in an inspired student’s way is the student themself. 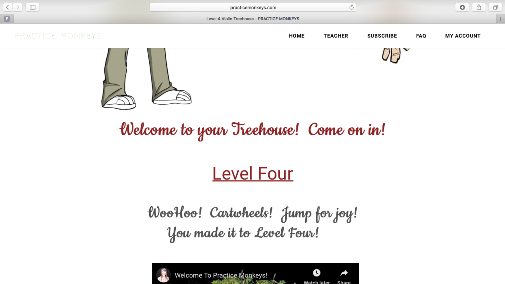 Each level has a “Treehouse” where all pre-recorded lessons are available to watch at your own pace, your own timing, accessible to repeat over and over until the nessessary skills are mastered. 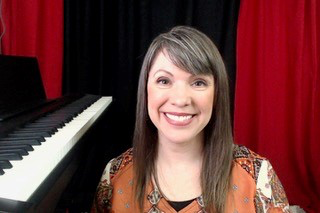 These lessons include skills and habits such as scale studies, proper hold and posture studies, string crossing exercises, and pieces of music that that “level” requires. 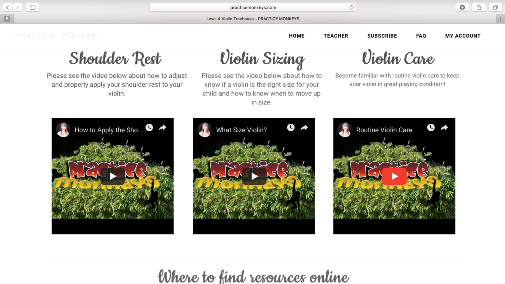 Each Treehouse also includes basic videos that help the parent along the way in how to go about teaching their child at home, how to tune your instrument and countless more resources such as books to purchase, music to listen to and so much more. 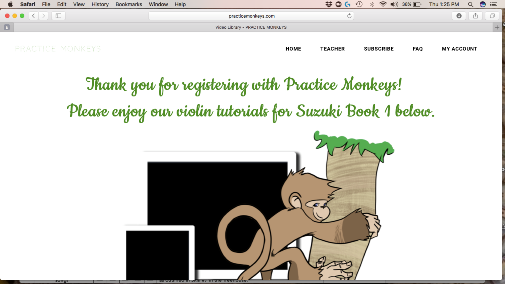 Practice Monkeys includes it’s very own music theory books available to download and work through (which I LOVE LOVE LOVE!!). I am so in love with the fact that these are specifically designed for Practice Monkeys and not some generic book that can be purchased on Amazon. I love that these are included in the treehouse and that I can download them and print as many copies as my heart desires. Live classes are held 4 days a week (Monday-Thursday) where the student pulls up a conference call link to their live class. The live classes are only about 15 minutes long in the lower levels, getting a bit longer in the higher levels, and are extremely thorough and never the same. They are tailored to the students in the class. Mrs. Sarah Van Kleeck does an amazing job at including every student every day as well as always having a patient, cheery composure and creates a positive atmosphere that cultivates an eagerness to learn. Missed your live class? Don’t worry! The classes from the previous week are uploaded to the treehouse the following week! I WOULD highly recomend making every single live class! 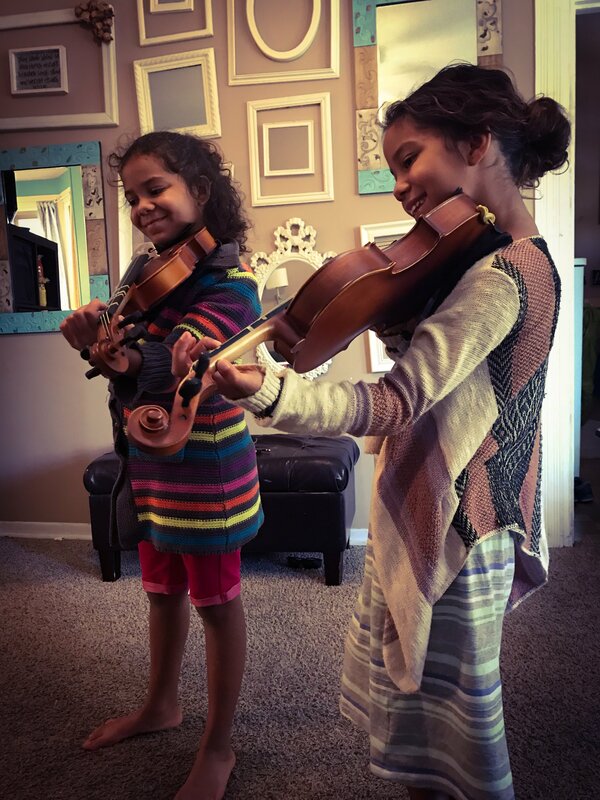 Being present during those live lessons makes the WORLD of a difference in the student’s confidence, connection, passion and growth in learning violin. Practice Monkey’s has 4 days of structured lessons and then encourages 2 days of Fun Practice where the student is set free to play whatever their heart desires. This fosters a love for the instrument, a deeper understanding and grasp on the sound and techniques of the violin, and a break from the drills and scales that playing the violin requires. It also encourages the student to listen to music and play pieces by ear. Each level’s Treehouse includes practice checklists that can be printed each week for the child to fill out and keep track of their goals. Practice Monkeys incorporates these wondrous things called “Assessments” into it’s strucual workup. These assessments are purchased as-needed throughout your travel down the road to greatness. An assessment can be used to get some one-on-one time with Mrs. Van Kleek, and is required in order to progress to the next level in the program. Mrs. Van Kleeck makes the environment comfortable and welcoming and utilizes every minute that you have with her for your assessment. At the very bottom of the Treehouse Page is an Assessment Form that has a nice, clear checklist of the skills, habbits, songs and techiniques that the student should have a good handle on before proceeding to the next level. 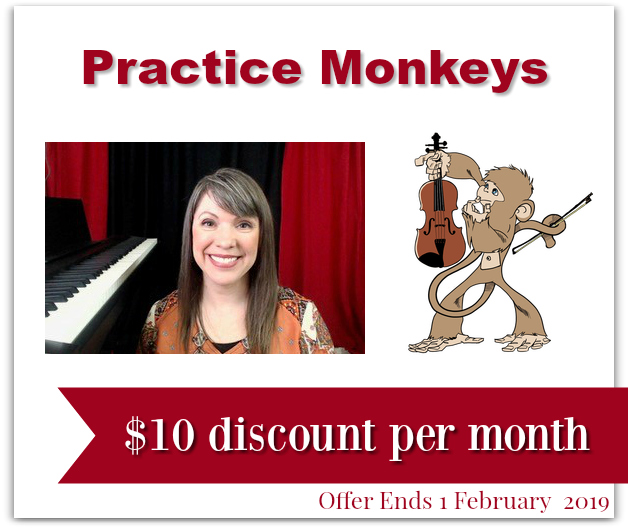 Practice Monkeys is the most brilliant, innovated music program I have ever run into or ever heard of! It has answered a prayer I didn’t even realized I prayed for and filled a void that we didn’t realize was so deep. I beleive in what Mrs. Van Kleek has laid out and I back it with whatever influencial weight I have. You can click here for a free week’s trial. You can also join NOW until FEBRUARY 1ST and get $10 off the regular monthly fee. Click on the banner below and PLEASE take advantage of this offer!!! 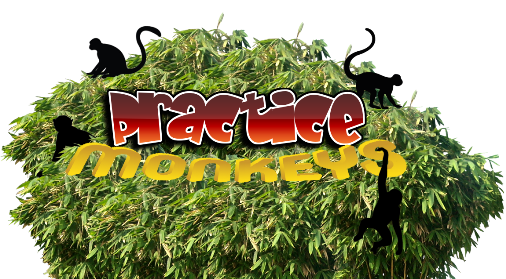 Click this banner to read other reviews of Practice Monkeys from my crew mates! !